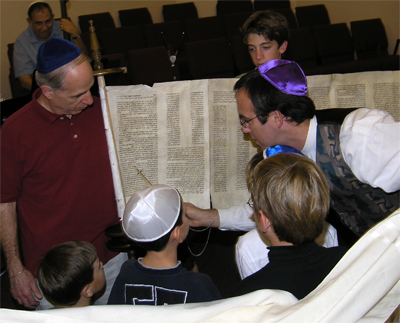 At Beth Shalom, everyone is welcome to participate in temple life, no matter what their approach to embracing Judaism or degree of Jewish literacy. We are respectful of each individual’s relative commitment to leading a Jewish life, and are always happy to welcome your involvement. Recently our facility underwent a renovation which included a Kitchen makeover. With beautiful stained glass, our sanctuary is a wonderful place to worship. We have a very rich, diverse, and evolving musical tradition that embraces many different styles. Rabbi Nancy leads every service with her magical and inspiring voice of harmonic melodies. Our Temple Choir brings musical joy to all. Our religious school and adult education programs promote reflection and learning along with a deep sense of community. We are egalitarian in our approach to leadership and worship, and most of us enjoy a personal relationship with our rabbi. Children are welcome at all services and are frequently welcomed to help on the bima. Most of all, we are a caring and unpretentious congregation, intimate yet not intrusive.